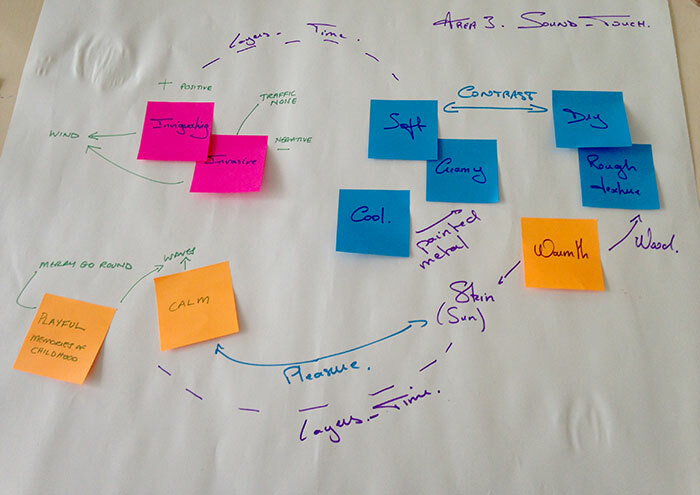 In June I attended the Design Research Society Conference in Brighton. Four fantastic days of workshops and talks on design research (of course). Two workshops were especially interesting for me because highly relevant to my research on sensory experiences. This is the first one, the other is available on the next post. The first workshop, Capturing & Shaping Meaningful Sensory Experiences the Urban Environment, was run by Dr Jenny Darzentas from University of the Aegean Konstantinopoleus 2 and Dr Lois Frankel from Carlton University and Editor of the Senses and Society journal. The workshop drew parallels with my research practice and I was interested to meet like minded people whose research and practice also incorporated multi-sensory modalities. It began with a short introduction and we were asked to think about the kind of events and qualities we’d be looking for when documenting a specific sense experience. For example, what would it be relevant to investigate and document across touch, sound, smell and visual. This quick fire round was the first level of interaction between participants and a good ice breaking activity. In the next part of the workshop. participants were paired up and given a map with pre-selected routes highlighted across 5 distinct sections. Kate MacLean, PhD candidate at the RCA (see my next post), worked with me to document touch, haptic perception, across Brighton. She specialises in smells so wanted to do something different and I thought touch was interesting because it usually comes with restrictions. After a highly enjoyable and fun hour recording haptic perceptions in the streets of Brighton, we came back to the studio where we were paired up again with someone who had selected a different sense. My new partner had been working with sound. Our next task came as a complete surprise. 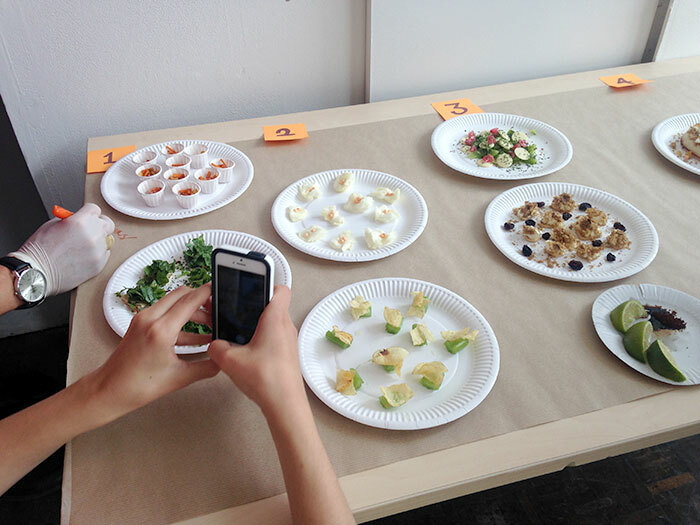 After 15 minutes spent charting the qualities of our respective sensory experiences, their sensory DNA, we were presented with an array of food ingredients for us to use to translate our perceptions into food preparations, food sketches as our hosts called it. 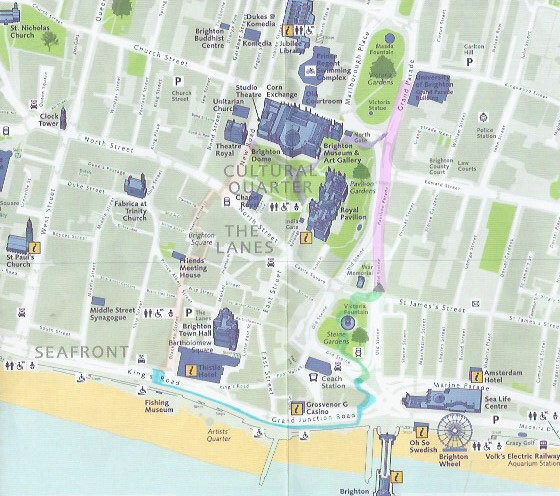 We used the taste, textures, colours, chewiness, wetness, dryness of the food to make a 3 course meal based on our sensory experiences of Brighton Seafront (blue route on the map). Our work also incorporated time and memory into the preparations. It was a lot of fun and everyone engaged with the activity with enthusiasm. Each team then presented their compositions, explaining the connection with the sensory journey through the city, while every one tried the dishes to get a taste of other’s experiences. 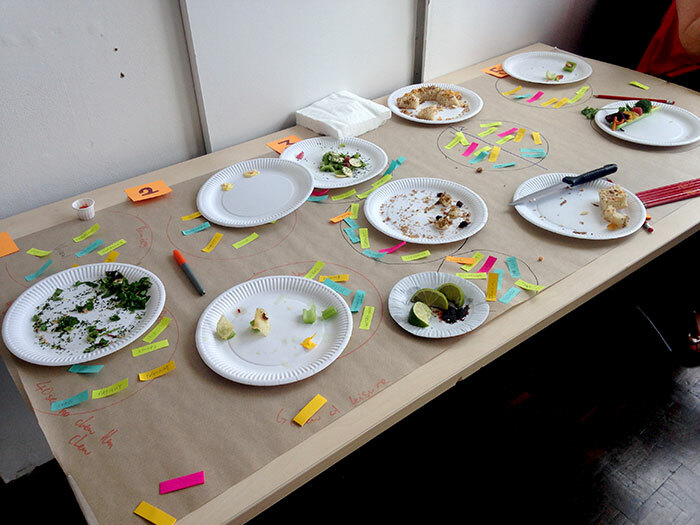 Participants were then asked to associate and adjective with each dish. The adjectives facilitated the expression of the qualities of the experiences to come through. A system of coloured dots and stars was also used for each participant to bring their own subjective evaluation into sensory experienced afforded by the dishes. Each coloured dot represented a sense, for example, green for smell, red for visual, blue for sounds and red for touch. We were given two dots of each colour and asked to place them next to the dish we felt had the most connections with the location it represented. We used the stars to mark the dishes we felt gave the closets representation of the sensory experiences depicted through food. Below are the details of the food composition from my team (touch and sounds, map location 3). 1st course – Ground coffee and lime, rub together with finger and taste. This unusual combination of two intense – bitter and acidic – tastes was designed to challenge and be invasive as a representation of the assault of the wind and traffic when turning the corner that connects the city’s interior with the seafront. It seemed to work. People felt the assault and the taste combination was definitely a challenge. 2nd course – Banana chip, mascarpone, crushed weetabix to contrast creamy and dry textures. This is a reference to the experience of touching the railing by the seafront where the smooth, almost creamy successive layers of paint contrast with the dry and rough texture of the timber railing (especially on the sea facing side after years of being battered by the wind and rain). We added a hint of cinnamon to add warmth to suggest the warmth of the sun on the skin and raisins to add sweetness and echo the seaside sounds and its associated memories. The contrasts came across clearly. 3rd course – A medley of kiwi, white chocolate button, pieces of strawberry sweets and parsley flakes to bind the flavours as a reference to the sight and sounds of the merry go round by the beach. Not directly related to touch other perhaps than the wind from the sea. This polyphonic sensory experience reconnects us to childhood memories, seaside sounds and associations with sweet tastes/smells, bright colour and fun. The dish was extremely well received and seemed to fulfil its role connecting people with seaside fun. The workshop was very well organised and I enjoyed the day. The translation of sensory experiences into taste was very interesting. Partly because taste is often neglected in the built environment (although it is connected to smell) and partly because I found the process enabled me to further explore, evaluate and, very importantly, share the experiences of urban spaces. The process of translation into food brought clarity into my understanding of the sensory experiences and the process of sharing enabled me to evaluate ways to transmit a highly subjective experience to someone else. Once the documentation and evaluation had taken place, I would have liked to be able to spend some time with others looking at ways in which this wealth of information could be used post-workshop. What new insights did I take away from the workshop? That, to some extent of course, it is possible to share subjective experiences. Enlightening! What were the most interesting, challenging, and/or inspiring sensory aspects that I experienced? I selected touch. It was for me the most challenging sense because it is so often the one sense that comes with many restrictions (can’t touch this or that, can’t walk here or there, touch amongst people is also culturally sensitive…). I enjoyed taking part in the sensory walk but it was challenging to separate one sense from the other and I often felt that other senses affected my ability to sense touch. Bachelard calls this phenomenon ‘the polyphony of the senses'(Gaston Bachelard, cited in Juhani Pallasmaa, The Eyes of the Skin. Architecture and the Senses. (Chichester: John Wiley & Sons Ltd, 2005: 41.). For example, when we approached a large fountain on the green, hearing and seeing water fall onto stone gave us some sense of what it would be like to touch the wet stone or stand underneath the water. Lived sensory experiences are mediated by others senses as well as imagination and memories. Another challenge was that as soon as we try to write down our thoughts on sensory experiences we objectify them and they lose their immediacy. Perhaps the process of translation and association with adjectives further dilutes the sensory experience away from its lived primary form? Being very familiar with the location was sometimes challenging because I had to be very mindful of expectations and assumptions (based on previous experiences/memories) taking over the lived experience. Saying that, I lived in Brighton for a few years and never did I realise that the railing on the seafront offered such interesting haptic experiences and information about location/environmental conditions. With a focus on touch, I noticed haptic qualities and non-qualities in the environment that I hadn’t seen before. A highly enjoyable workshop, great facilitators and fantastic co-participants. This entry was posted in Perceptions, Sensory and tagged Brighton, Brighton University, design research, Design Research Society, DRS2016, food, Jenny Darzentas, Kate McLean, Lois Frankel, perceptions, RCA, sensing, Sensory. experiences, smell, sound, touch. Bookmark the permalink.